Just came back from putting a new front tire on my bike. The old one (PR4) had 10k miles but still looked like it had a few more k left. Upgraded to a Power RS because I'm taking the bike to a track day this coming Sunday. We'll see how long this one lasts. While in there, changed the pin that holds the pads in place in the brake caliper because they were making a knocking sound over bumps. Haven't heard the sound yet but I didn't ride it long enough. We'll see. Checked wheel bearings for play, seemed solid. Hey don't just zip tie that - put a bead of silicone or epoxy between the connector and the bracket first, and let it cure. Not for wear, but to hold it more securely as you pull and push on it when using it. So I secured the deal for the previous owner of my Gen I to buy it back.. part trade, part cash..
That's a happy story. Where does the seller live? I see a blue gen 1 coming through Smyrna on the E-W connector on many good weather days. Epoxy is a no-go. 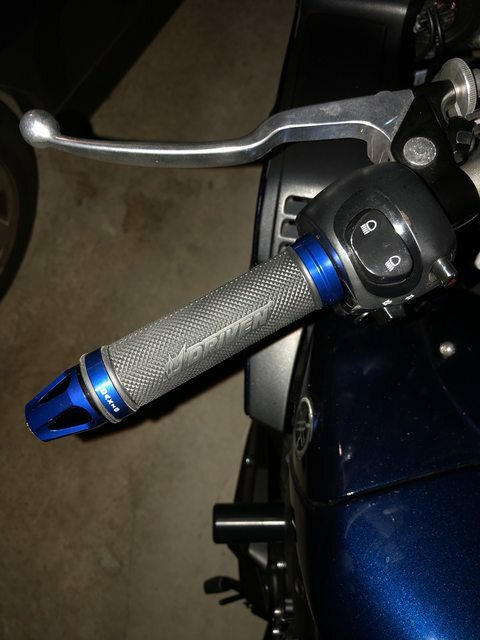 A quick ziptie will let me shift it quickly, if I want to put passenger pegs back on at some point. Congrats on the buyback on the Gen1, btw. Use one of these, may require some trimming of the insulated boot, and some rebending. But it will hold it out of the way and keep the zip tie from chafing the paint on your hanger. Not mine. It hasn't been ridden in over two years.. I also see and identical one parked at Hartsfield all the time on Level 2 parking deck. Maybe an employee. There are a lot of blue ones around. Mine has no stickers on the fairing, and the tank - being an '01' - has YAMAHA instead of the tuning fork graphic. The big blue belly pan also makes it unique..
A much more solid mount Michael. I learned of those while working avionics 30+ years ago. Solid, effective, and looks good. 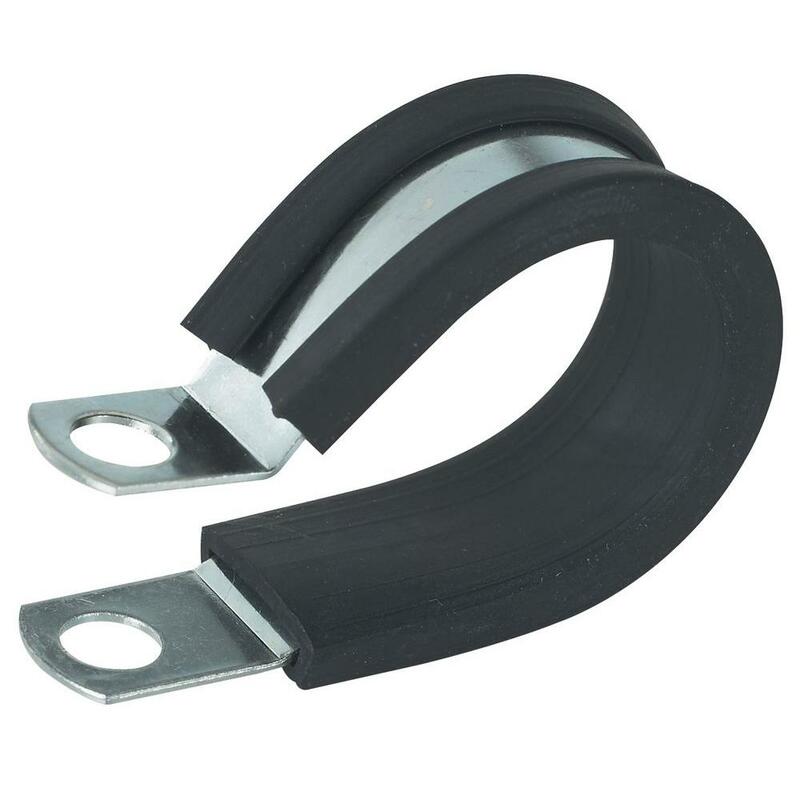 If you search R type cable clamp, you will find a bunch of these in nylon, which could be a good option to prevent fraying. We use these at work often and they are sized by the ID. 3/8 to 5/16 will work well for heated gear cables. Rain is coming the next few days, so I parked the FZ1 under the cover with the tender and pulled out the Enfield for the wet weather duties. Well we were supposed to go to deals gap last week, but the hurricane made us opt out, so then we decided to go to ocmd bike week, well the hurricane also was forecasted to hit that area, so we also opted out of that. We had already taken the days off work. So we spent 50 miles on the woods on the dirtbikes in the pouring rain, then packed up the dog and bike and headed to the poconos, only to ride in more rain, lucking Saturday and Sunday dried out a bit to hit up some wineries and brewery’s to take some bottles home. Did a nice 500 mile two up long weekend on the fz. This has been a low mileage year, only a set and a half of tires used (10K). Had a few hours off from my elder care (Dad) duties, so I changed the chain (Thanks PJ) and sprockets. I've used a DID chain riveting tool for the last 15 years and while it works great, I still have to struggle each time remembering how to use it correctly. In the end I usually rip up my man card and resort to reading the instructions. It's that center hole in the back of the U clamp that always trips me up. You don't want that hole on the back side of the master link pin when your setting the rivet unless you want to drive it out the other side thru the hole. It always makes sense when it's done, but never when I'm doing it. As soon as the sun comes out here in Willow Glen, i am going to do the last bit of paint work, on my 2001 FZ1. Going to paint a spare gas tank deep purplish blue, and use the "tuning" fork decals on each side. The gas tank on the bike is perfect, but the "Yamaha" white lettering, i have never liked, on the gas tank. So, that should do it, paint wise for now. There are some small scratches on the frame, but will attend to those, another time. Bout got this FZ1, straighten out. Will do some photos, after the gas tank is installed. The bike pops! I actually rode it. Between work travel and life intervening I haven't ridden much in weeks. The gas tank is painted, and it looks very good. Not perfect yet, as it will need copious amounts of water, and 1500 grit wet sandpaper, then number 16 Meg. polishing compound, along with my elderly 7" mop buffer, then a couple coats of wax. After all that, the piece should look like a billiard ball/new money! lol! God help me, after fifty six years of doing this nonsense, i still love throwing on paint! lol!